Famed techsploration company BBN - renowned for inventing forerunner internet kit, and for giving the world the "@" symbol in email addresses - has received a hefty wedge of green from the US military to automate out of business everyone who uses the internet for a living. The Pentagon's Machine Reading programme, which we here on the Reg my-job-went-into-the-cloud desk reported on last November, last week awarded BBN $29.7m to develop processing software able to turn "natural language" information - for instance text written by humans for humans - into "formal language" data usable by military AI systems. Machine Reading technology would be used particularly by military intelligence staff seeking to boil down mountains of information about theatres or areas of operation into useful form. One need hardly add, of course, that Machine Reading comes to us courtesy of DARPA - the agency which seeks to develop the possibly-battle-winning technologies of the future not only before the enemy is able to do so, but in most cases before its own people are able to do so. 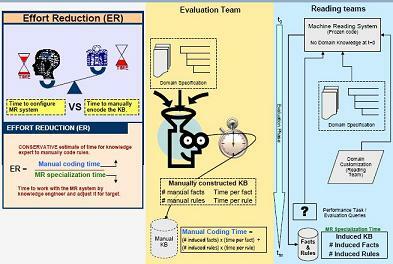 In the case of Machine Reading, DARPA plan to assess several candidate systems - BBN's among them - by a complex process apparently involving the implantation of a funnel into somebody's head (see graphic). "The machine reading system that DARPA envisions is not evolutionary, but revolutionary," says Prem Natarajan, speech and language processing veep at BBN. "Such a system could eliminate many of the impediments to stability that our military faces such as a lack of understanding of local customs, and give us the ability to assess global technology developments continuously." Sadly for many people, the Machine Reading ware would also be of use to skinflint biz and gov overlords seeking to avoid the expense of having people in offices reading the internet and reprocessing it. This could see intelligence officers, analysts and pundits of every stripe, even Reg hacks forced out of employment.